Make typing on your iPad more comfortable with an Apple keyboard. Slender and stylish, these keyboards combine Apple’s signature looks with ultimate functionality to help you get more from your iPad and Mac experience. Our Apple Mac keyboard range gives you two keyboards to choose from. Both are slick, sleek and slender aluminium designs. Choose the wireless model for its more compact, go-anywhere size and cable-free portability. For greater functionality, look to the full size keyboard that features a numeric keypad and plugs straight into your Mac via USB. Both make it easier to compose emails, type, and browse online, especially for longer periods. All of our Apple keyboards feature Apple’s signature low-profile keys that you’ll find on MacBooks. These make for more comfortable typing and a more responsive feel. 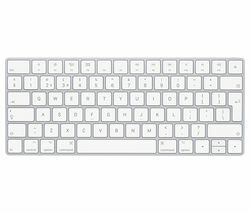 The wireless Apple keyboard connects via Bluetooth and gives you a range of up to 30 feet from your iPad or Mac. Both are made from Apple’s familiar and ultra-durable anodized aluminium, and wireless models utilise intelligent power-management to automatically power down when not in use, saving you battery life. 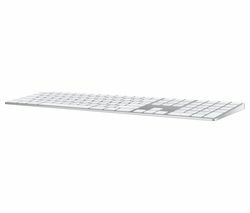 For the most stylish keyboard accompaniment for your Mac or iPad, make it an Apple keyboard. For more choices see our entire range of keyboards, including gaming keyboards specifically tailored to your gaming needs.